These two episodes show that this ridiculous Rory and Lorelai feud went on at least twice as long as it should have. Five episodes in now, and these TV hours, like Rory, are wallowing without direction or consequence. “We’ve Got Magic To Do” edges out “Welcome To The Dollhouse,” though, because at least there’s an event to wrap everything around, and a satisfying Huntzberger takedown. Rory’s glee at domineering the DAR event is rather horrifying, as Richard finally realizes at the end of the episode. If, as he recalls to Emily, this is a girl who can conquer anything she sets her mind to, why is she seemingly so happy being so directionless? Why didn’t the show show us anything from Rory’s side, other than hanging on Logan’s every word? Like, researching other types of jobs, if she wasn’t going to be a journalist anymore, checking out law schools or med schools? Doesn’t she miss her mother? Without Rory’s actual search, we’re as flummoxed as Richard, Emily, and Lorelai as to what’s in her actual head. At least Rory’s freakout over Mitchum shows that she’s still reeling from that critique, and still can barely face him. It could be, as Richard seems to acknowledge, that the DAR offered the worst kind of distraction for Rory: something to focus on so that she didn’t have to think about the rest of her life. The Huntzberger confrontations are indeed satisfying, but no matter how upset Mitchum makes Richard, you’ve got to admit that he’s absolutely right. If Rory really had what it takes, his critique wouldn’t have stopped her in her tracks, it would have made her fight even harder. I also appreciate his refusal to lie to Richard and agree with him when he says his granddaughter could be the next Ben Bradlee. The whip of Emily’s head when she decides to go after Shira is delicious though, and her scathing indictment of Ms. Old Money is breathtakingly brutal, Emily at her most magnificent. The corresponding event—Patty’s recital—also offers more evidence what we saw so much last week: that Luke and Lorelai had a solid relationship before the idiocy of the April plot showed up. Her intentions might have been good, but Lorelai was wrong to send Luke off camping when he didn’t really want to go—but instead of festering, he brings it up immediately, and she apologizes. There was actually nothing wrong with them, necessitating a virtual and unfortunate wrench int the works. "We've Got Magic To Do"/"Welcome To The Dollhouse"
Rory’s meandering reaches its peak in this episode, as Richard’s horror that ends “Magic” is spot on: Rory, an aimless young person, is seemingly happy to spend her days as the youngest-ever member of the DAR and hanging out with Logan, and receives a five-figure Birkin Bag for her trouble. As clueless as we are, the elder Gilmores are reduced to searching the pool-house just to look for any clues as to what Rory’s new life consists of, and all they come up with is that damn Birkin Bag, which is a bit symbolic: empty and over-priced. With nothing else to focus on, we are thrust into the worst kind of Taylor-led whimsey: the ridiculous renaming of all of the Stars Hollow street names. Can’t even imagine all of the change-of-address problems that would cause for literally everyone, even if they’re not saddled with Sores And Boils Alley. The only bright spot in the whole episode happens at the end, when Richard, after a frustratingly nebulous conversation with Logan, shows up on Lorelai’s doorstep with her childhood dollhouse. The dawn is finally beginning to break, and Richard now knows that he hasn’t been helping Rory at all, but enabling her. Can’t wait to see the Gilmore Girls get closer to ending this rift next week. At least “Magic” has Paris as a new member of the proletariat working class. Agree with Emily that Lorelai is in a “I don’t know what my hair is supposed to be” phase. 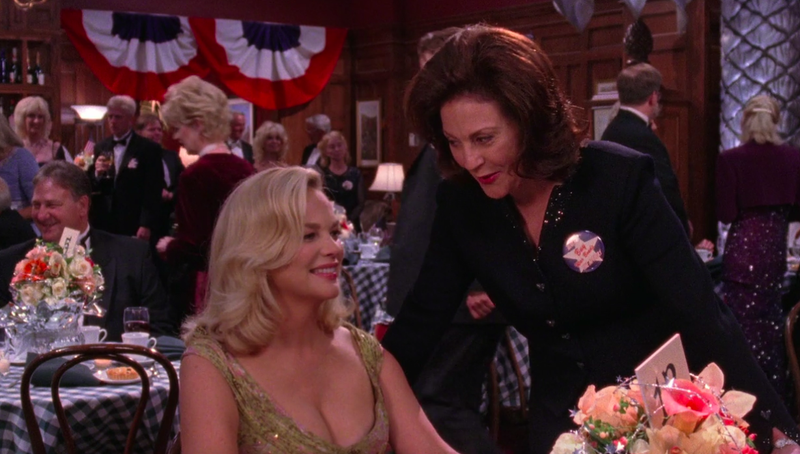 Worst Gilmore Girls outfits: A big fat no to bow-tied blouses topped with too-small cardigans. Also, more hairstyle than outfit, but Rory’s frizzy bangs kind of ruin her whole Hollywood Canteen look. This week in Gilmore entitlement: Fat-shaming another woman’s underwear. Next week: Jess finally shows up to set everything straight, thank god.